Lexington, Ky. (Feb. 11, 2019) - For as long as she can remember, Xava Grooms has been eager to find solutions to some of the world's most complex problems. "No matter how small or big the problems are, computers help create solutions," she said. "My newfound passion for computer science drives my ambition to save the world, so to speak." 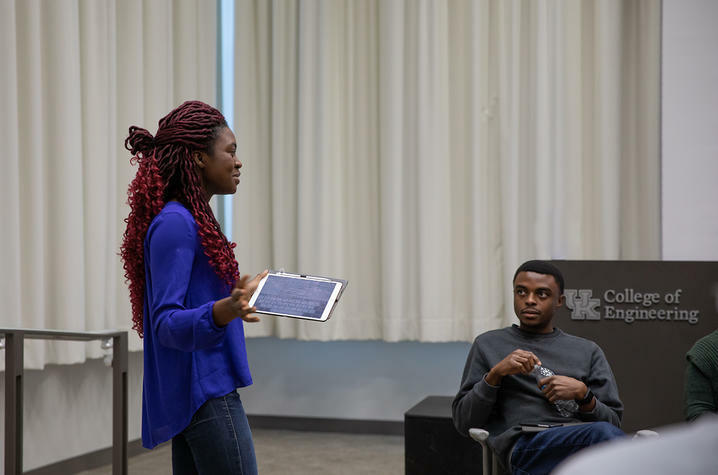 Grooms, who is pursuing a doctoral degree in computer science (CS) at the University of Kentucky, doesn't wear a cape like the superheroes on the big screen, but she is armed with knowledge and determination. Grooms believes, to save the world you have to understand the world — including everyone in it. "Having women, racial minorities and LGBTQ people at the table ensures that complexities involved in smaller groups are not looked over, creating a better societal experience for all." Grooms is no stranger to feeling overlooked and underestimated. As a black woman and member of the LGBTQ community, her pursuit to become an engineer has been challenging. "While obstacles and barriers are real and can be anxiety producing, where there is a will there is a way." The sheer will Grooms has to succeed is undeniable, but admittedly — the California native didn't achieve success completely on her own. She has the guidance of Corey Baker. "As a mentor, he uses his own past experiences to guide me towards my goals and ensure I persevere through adversity," she continued. "He constantly finds ways to challenge me and hone my skills as a critical thinker." When it comes to making decisions about a community that is extensive and expansive, having valuable input is critical. That's why diversity is an important trend being talked about in tech. Baker, an assistant professor in the Department of Computer Science, is going beyond the conversation. Since joining the College of Engineering in 2017, he's made it his mission to ensure equal access to opportunity and learning. "As tech companies continue to engage in relationships with more diverse clients and partners, cultural sensitivity and cultural competency become increasingly important," Baker said. Each underrepresented minority faces unique structural and social barriers in both exposure and access to computer science. As a result, diversity in this particular industry is negatively affected. Baker poses this question — how do we begin to address the problem? He believes, universities must do a better job recruiting, retaining and graduating minority students in engineering. 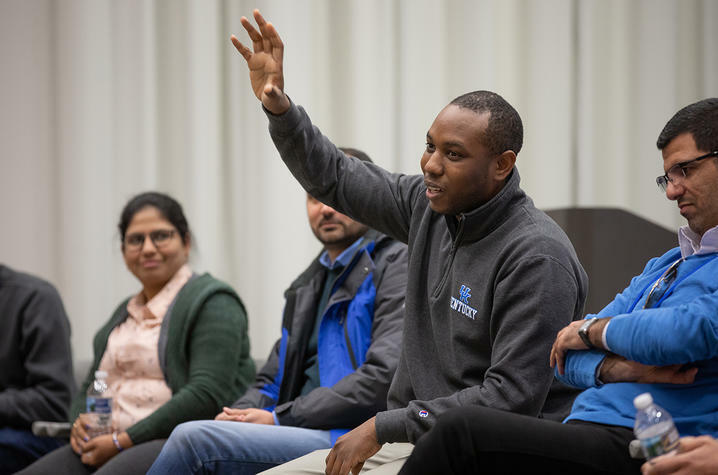 Baker has created a graduate campus visit program that has garnered interests of more than 70 prospective underrepresented minorities (URMs) from around the country. In January, the college hosted 13 of these bright students to show them first-hand the groundbreaking research being conducted on campus. "Many people outside of the state of Kentucky are not aware of the abundant resources UK has to offer," Baker continued. "It is my belief that once a person steps foot on campus, they will be pleasantly surprised and come to the conclusion that UK is the place for them to pursue their graduate training." Through intentional education and research, Baker aims to further develop the community of engineers. So far, his extensive efforts have been successful. The Department of Computer Science currently has five black students earning their doctoral degrees, two of which are women. Those numbers are incredibly significant, because five is the largest number of black doctoral students the department has ever had at one time, and it accounts for more than half of the total black doctoral students in the college. On top of that, the graduate students Baker has recruited are performing extremely well, averaging a 3.73 GPA. The numbers are also remarkable on a national level. According to the Computing Research Association, the number of black doctoral students enrolled in computer science nationwide is at 1.4 percent, while UK is at 7 percent. "Computer Science is transforming every aspect of our society. 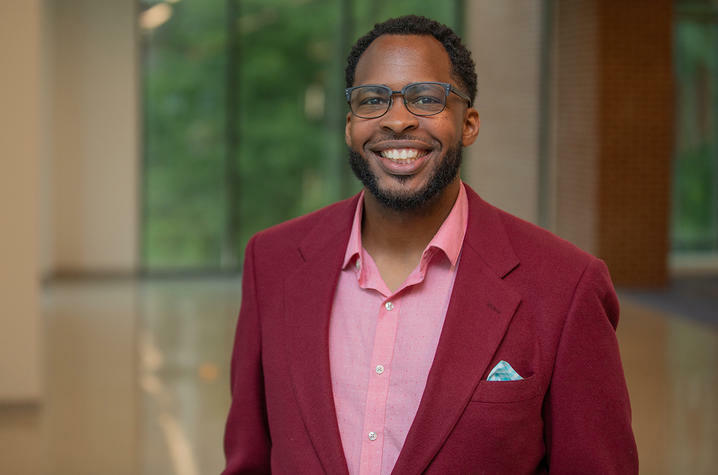 It is clear that future innovation and progress, which affects us all, must include a wide diversity of voices, experiences and ideas," Brent Seales, the department chair, said. Fellow faculty members agree Baker's dedication to diversity is nothing short of impressive. "Dr. Baker's commitment to scholarly productivity and expectations for academic excellence were evident from the time we first met," Sonja Feist-Price, vice president for Institutional Diversity, said. "I remain impressed with his scholarship and his commitment to mentoring students. I'm delighted he is a faculty member within our UK family." While significant strides have been made — Baker acknowledges, there is still more work to be done. "It is our hope that we can continue creating a sustainable diverse and inclusive environment here at UK, which will produce research that impacts the world," Baker added. When it comes to making a lasting impact, Grooms has already embarked on that endeavor. Her research is helping to further drive advancements in drone fleets, allowing drones to better collaborate on missions, particularly in hazardous situations such as disaster relief. Grooms knows she can't "save the world" by herself, so she's encouraging fellow students — despite their gender, race or ethnicity — to pursue their passion. "My advice to any young person interested in CS is to not to allow their fears to guide them, because anything worth doing is not easy." Baker and his students will be featured on an upcoming edition of NBC Learn on Feb. 20. For more than 80 years, NBC News has been documenting the people, places and events that shape our world. NBC Learn, the educational arm of NBC News, is dedicated to making these historic stories, images and primary source documents available on demand to teachers, students and parents. More specifically, NBC Learn K-12 provides an easy, affordable and effective way to infuse technology and digital media into 21st century learning. For more information about the Department of Computer Science you can go online.